Streamified allows you to link your existing social networking accounts to stalk, share, and follow from one simple, intuitive iPhone, iPod Touch, and iPad app. It reduces the time you spend opening and closing social networking iOS apps, so you have it all in one place with clear controls and great functionality. The Streamified iPad app takes a bit of time to link and authorize your accounts. You swipe the screen to the right to add a feed through the sliding left side menu similar to Facebook’s iOS app. A list of suggestions include Facebook, Twitter, LinkedIn, Tumblr, and Instagram. The request for permissions for Facebook is very thorough and allows you to opt in and out of several sharing and access issues. Streamified may post on your behalf including links you viewed. I have recently noticed some unfortunately chosen articles and videos posted on my friends’ timelines. So, this is the sort of permission that prevents embarrassment. The other listed social networks do not have as many customization features, but the authorizations are reasonable. Other social options are Readability, Instapaper, Pocket, and Google Reader. Currently, you can view the stream of your Google Plus account, but you cannot post via Streamified iPad app interface. Once this feature is introduced, it will be offered as part of a Streamified iOS app update. Another great feature of the Streamified iPad social networking app is the ability to add different feeds to follow. You can choose to follow specific Pinterest feeds like geek and home decor. You can opt-in to Reddit feeds. I am ready to shock and amaze my Minecraft-loving children with my amazing knowledge gleaned from the Minecraft Reddit feed. The Streamified iOS app has carefully curated groups of websites and blogs, so you may follow influential online resources. You can follow Lifehacker, Business Insider, Fast Company, CNN, and Huffington Post. With a touch, you select a topic, then options appear for you to add. To delete a feed, you just open your list of feeds from the right menu and deselect it. For each social networking application authorized and feed authorized, you choose how or if you want to enable notifications. With a simple visit to the settings icon in the sliding menu, you can change notifications preferences and create a silence period. The ability to add, delete, select notifications, and define silence parameters is integrated with agility and intuitive gesture controls. The Streamified iPad app news feed has an attractive visual presence. It is a leather journal with sophisticated vibe. The photography and posts are presented as journal entries with the name of the person or group who created the content. Each journal entry has the icon of the social network that produced the content. If you want to select specific feeds, you simply touch the top menu bar and select a feed. 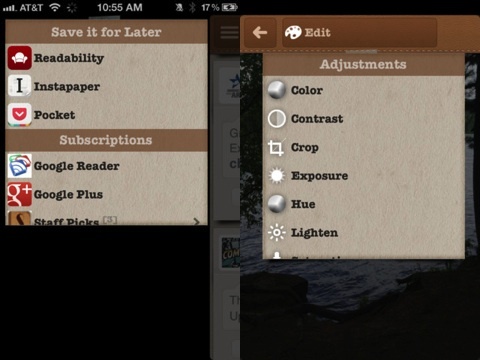 Your Streamified iPad app’s home screen is instantly filtered. From your news feed, you can respond and share just like you are using the interface of the social media provider. For a Facebook post, you can like and comment. For Twitter, you can retweet, quote, and reply. You can access a quick profile overview of each person or provider of content. For your Twitter content, you can access photo, name, location, following, followers, and tweets. With a nod to multiple feed marketing tools like HootSuite, you can share an item through multiple social networking applications and email. You simply touch the share icon, add your text, location, link, and photo to create your content. Then, you touch the social networks where you want to share at the bottom of the screen. You touch post, and the Streamified iPad app distributes your content. If you select to email your post, your contact list is activated to send from the Streamified iPad app. It would be nice to select a future time for posts, but currently that capability is not available. 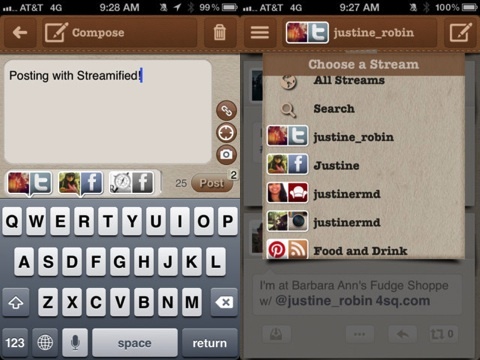 The Streamified iPad app streamlines your social networking applications with fantastic functionality and great ease. AppSafari review of Streamified was written by Jenni Ward on June 27th, 2012 and categorized under App Store, Feeds, Free, iPad apps, News, Reading, Social, Universal. Page viewed 4940 times, 1 so far today. Need help on using these apps? Please read the Help Page.